Bennington's influence to the contemporary Morgan is secondary only to that of Justin Morgan (Figure) himself. The first colt by General Gates at the Government Farm, he shared stud duties there with his sire and fathered 89 foals. 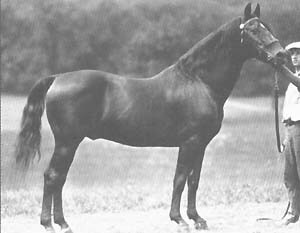 His somewhat controversial dam, Mrs Culvers, was a Kentucky -bred mare with saddlebred ties. Yet between both parents, he inherited 5 crosses to Black Hawk, a grandson of Justin Morgan who bred 1,772 mares, as many as 200 a year! 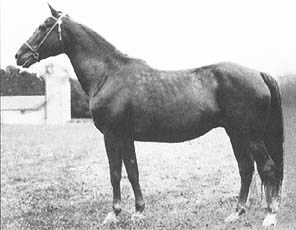 Bennington is best known for his golden cross with the mare Artemesia (pictured below). 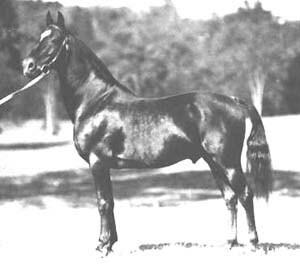 Their first foal was Mansfield, who, along with his dam, was quickly purchased by the Government Farm to become the heart of the Government breeding program. This cross also produced Ulysses, Canfield, Querido and more. Through these get, and his grandget, such as the stallion Goldfield, Bennington left an influence that can be traced through the pedigrees of horses such as Chasley Superman, Waseeka's In Command, Trophy, Serenity Flight Time, Beamington, Courage of Equinox, and UVM Flash. 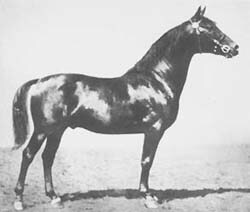 Bennington was active early in the 20th century, a pivotal time for the Morgan breed. 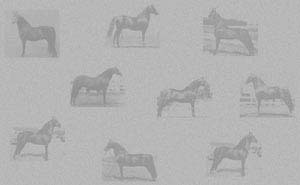 With the advent of the automobile, demand for these economical, stylish horses waned and the breed nearly died out. Bennington helped transform the breed from a mode of transportation into the pleasure horse we have today.